Where did the American Cream originate? This is the question most frequently asked by those seeing them for the first time. We point with pride to the fact that the American Cream Draft Horse is the only draft horse recognized as a breed that originated in the United States. breeds, the type and quality have been improved while the color has been maintained. From the first, they were admired by all who saw them. It was not until approximately 1935 that any special effort was put forth to make a distinct breed of them. At that time, a few foresighted men began line breeding and inbreeding with the hopes of establishing a new draft breed. The American Cream horse is strictly of draft breeding and must not be confused with palominos or other light breeds. Our records, tracing back to the beginning of the twentieth century, do not indicated any other than draft breeding. Breed Standards for American Cream Draft horses call for light, medium or dark cream color on pink skin, white mane and tail, and amber or hazel eyes. Foal’s eyes are almost white the first year. White markings on face and legs are desirable. Creams have long manes and tail, and tail are not docked. Ideal mature (five years) height and weight of males (five years) is 16 to 16.3 heads and 1800 pounds and up. Creams exhibit a refined head, well proportioned to body and wide-set, large, intelligent eyes, small expressive ears and flat nose profile. They are short coupled with well-muscled hindquarters, wide chest, good sloping shoulders, short, strong back; deep throughout the heart girth, ribs well sprung, good strong legs in proportion to body set wide apart with strong, sure feet. Their movement is smooth and easy, pricking up feet and setting squarely on the ground. Their temperament is best described as amiable, easy going, willing to please, and trustworthy. On recommendation of D. Phillip Sponenberg DVM, PHD> Virginia-Maryland Regional College of Veterinary Medicine and Chair of Technical Panel, American Livestock Breeds Conservancy, appendix tracking is being done. 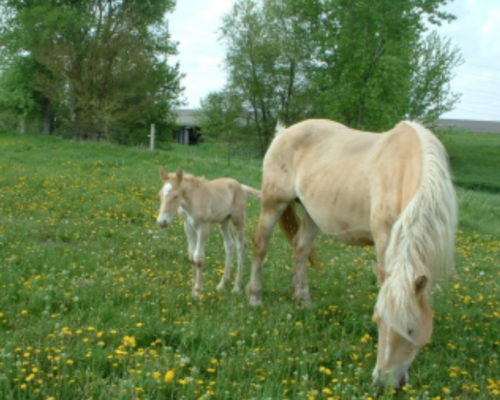 Foals from cream matings that are considered too dark colored for full registry and foals from cream to other registered deaf breads (1/2 cream) are allowed in an appendix registry so long as they meet certain requirements. From that there is an upgrade system to ensure the offspring will be mated to full creams which we believe will strengthen rather than dilute the genes and increase numbers. Until such time as the books are closed to outside breeding, a cream mare with dark skin and light mane and tail will be accepted for foundation stock. Stallions must, however, have pink skin and white mane and tail to be accepted for registration. In the Spring of 1944, a group of interested breeders met in Iowa Falls, Iowa and laid plans for forming the American Cream Horse Association of America. Directors and officers were elected and negotiations to obtain a charter were begun. On July 11, 1944, the charter was granted by the State of Iowa. Under this charter, registrations and transfers are made. In November 1948, we were recommended for recognition by the National Stallion Enrollment Board. On February 15, 1950, we were recognized as standard by the Iowa Department of Agriculture. This gives us all the privileges granted to older established breeds in the state. stated that after five years no animal would be registered unless both sire and dam were Registered American Creams. Applications for registrations fail to verify that the ruling ever when into effect. In 1982, three member families and the secretary met to reorganize. It was voted to continue to allow females with dark skin to be registered while retaining the ruling that stallions must have pink skin. Blood typing, recommended by E. Gus Cothran, PHD, Texas A&M University, was begun in 1982. This has established that, compared with other draft breeds and based on gene marker data, the American Creams form a distinct group within the draft horses. In July 1994, Restated Articles of Incorporation resulted in the name change to The American Cream Draft Horse Association. Since reorganization, over 500 animals have been registered with the Association. We have members all over the United States now enjoying membership and owning American Cream Draft horses. 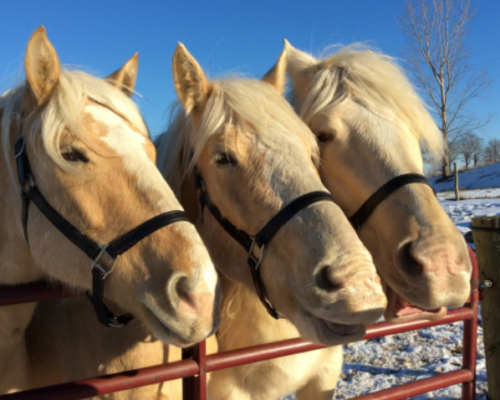 The members have pledges themselves to develop and improve by careful study and breeding, the breed of horses known as the American Cream Draft horse and to make and preserve accurate records of the breeding and ancestry records of these horses. In an effort to obtain these goals, the Herd Book has been made available without cost to the members and is updated annually. Each American Cream horse, owned by a member, eligible for registration, must first be registered and, if sold, transferred to the new owner. 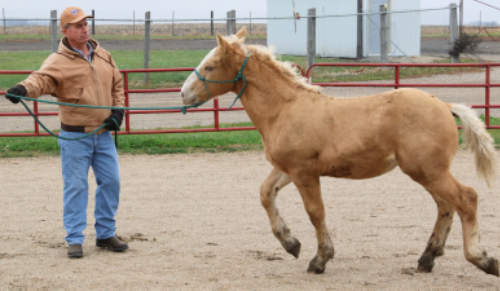 As word of the breed having been placed on the ‘endangered breeds’ list surfaced, owners and breeders accepted the challenge to come together as an association and replenish the numbers of this great American Cream Draft horse. The Association has put in place regulations for Artificial Insemination and also Embryo Transfer and the registration of foals resulting from these services. The Cream Newsletter has improved communication among the membership and helped them keep abreast of new developments. It was started in 1991 and has expanded into a quarterly publication. Members are encouraged to advertise American Creams for sale and to submit articles to be printed. Our Association hold an Annual meeting in different locations around the USA in order to accommodate as many members as possible. Changes in bylaws and new developments are discussed and acted upon. Guidelines for showing American creams have been developed and today the American Cream can be seen participating in many different venues. Eager to please in the field, show or under saddle, American Creams are becoming known and loved nationwide.